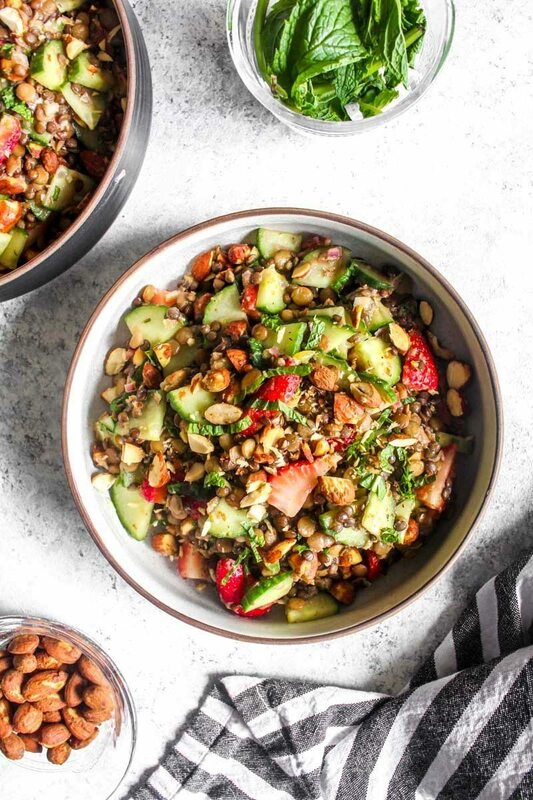 This healthy Summer Lentil Salad recipe is full of crisp cucumbers, sweet strawberries, crunchy almonds, and is marinated in a bright and herby dressing. In a medium pot, bring 3 cups of water to a boil. Add in the lentils and stir. Reduce to a simmer, cover, and cook until the lentils are tender, about 15-20 minutes. Drain the lentils and add them to a large bowl. Immediately add in the dressing while the lentils are still warm and toss well to coat. Add in the remaining ingredients and stir. Serve warm or place in the fridge for 1 hour to cool.